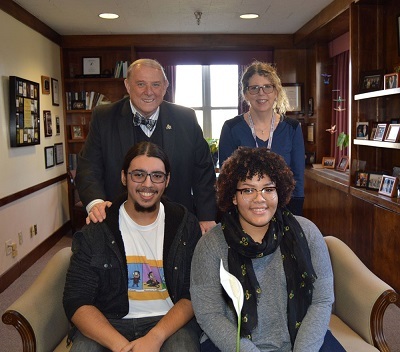 Under the direction of the Riversville Foundation's Executive Director, Bruno Casolari, a former Director of Resource Development at RCC, the Foundation has awarded more than $135,000 in need-based scholarships to more than 25 Rockland Community College students in the last two years. These students must maintain a strong GPA and a commitment to academic excellence. At the luncheon, this year's scholarship recipients spoke about their paths to RCC, their academic and career plans, and what receiving the Riversville scholarship has meant to them. A special thank you to Elizabeth Kendall, Associate Vice President of Resource Development, for coordinating this scholarship program. 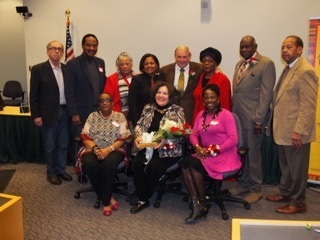 The AAHS held its annual meeting at Rockland Community College on December 12, 2016. The AAHS Board honored Wylene Branton Wood for her ten years of service as president. Each year the AAHS gives a $500 scholarship to an outstanding high school history student. The scholarship is now the Wylene Branton Wood Scholarship. The Society also thanked President Wood for his support by making a $250 donation to The Kurz Presidential Student Support Fund. 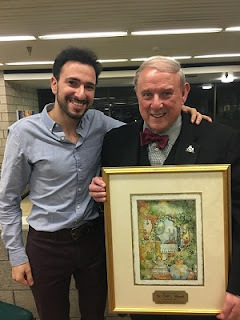 I was very pleased to attend a Friday night Shabbat dinner hosted by the Center for Jewish Life and Hillel of Rockland, and I was honored to receive the "Mensch of the Year" Award. It was gratifying to see 120 students, alumni, faculty, parents and community members come together for the 10th annual Faculty/Student Shabbat celebration. Student Yankele Friedmann with Dr. Wood, who is displaying the painting and plaque he received commemorating his honor of Mensch of the Year 2016. 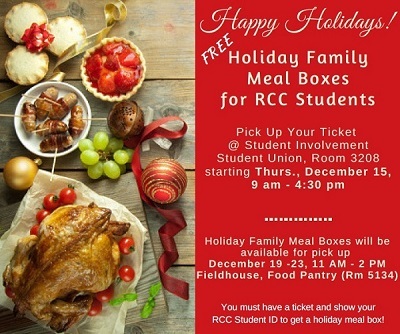 Through a generous donation from the RCC Federation of Teachers, the College’s Food Pantry will be providing Holiday Family Meal Boxes for our RCC students. The Food Pantry will be open from 11am – 2pm, December 19 – December 23. Dr. Wood presents Eileen MacAvery Kane’s Graphic Design students Adam Quinones (birthday card), and Mariah Salter (holiday card), copies of the cards they created for the President’s Office for their portfolios.